A front addressed to the Bank of British North America at Halifax, Nova Scotia, is much waterstained and the adhesives have floated off. Although part of a registered cover, all datestamps are illegible, and one can only guess that it originated in Barbados. There is a clear handstamp in grey-blue from rubber type FROM WRECK OF S.S. ‘COBEQUID’, in sans serif capitals 5 mm. high, 96 mm. overall. This cover was first reported in Stamp Collecting of 27th January, and 10th February, 1951, where on the authority of “Royal Mail the centenary history of the line”, published in 1939 it is stated that the Cobequid was owned by the Royal Mail Steam Packet Company, and ran on their Canadian-West Indies service. The ports of call were Halifax (N.S. ), St. John (N.B. ), Bermuda, St. Kitts, and then the various islands down to Barbados, Trinidad and Georgetown (B.G.). The service was opened by the Cobequid, which sailed from Halifax (N.S.) under Captain J. Howson on 23rd November. 1913. On her return trip from the West Indies she ran aground on to the Trinity Ledges in the Bay of Fundy, during a blizzard early in the morning of 13th January, 1914, and immediately settled down. Fortunately the super-structure remained above water, and here the passengers and crew congregated under freezing conditions until the following day, when all were rescued by coasting vessels answering the wireless call for help. Illustrated here is a second example which is a full cover but there are no date stamps on it but for a portion of BARBADOS / 30 DEC 13 which was left behind when the adhesive so cancelled washed off. 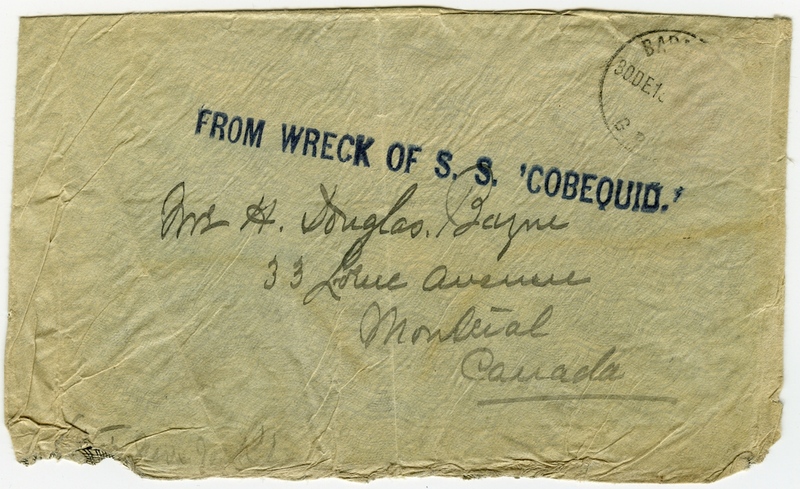 This is addressed to Montreal and has the full strike across the front FROM WRECK OF S.S. ‘COBEQUID’. The ship, incidentally, was named after the Cobequid Inlet, at the northeastern end of the Bay of Fundy in Nova Scotia, where there is a phenomenal tide of 53 feet. It is a coincidence that she came to her doom in home waters!